Please note that the application process for the 14th SCANCOR PhD Workshop on Institutional Analysis is now closed. Among the 86 applicants, 25 will be admitted. When the selection process has ended (in the end of April at latest), every applicant will be notified by mail . Thank you for all your applications! Students will take away new insights and measures, and a deeper understanding of how to match conceptual questions with research methods. The workshop will prepare PhD students to carry out their own individual research using the methods of institutional analysis. Teaching faculty include Woody Powell, Sarah Soule, Patricia Bromley, Gili Drori, and Bruce Carruthers. 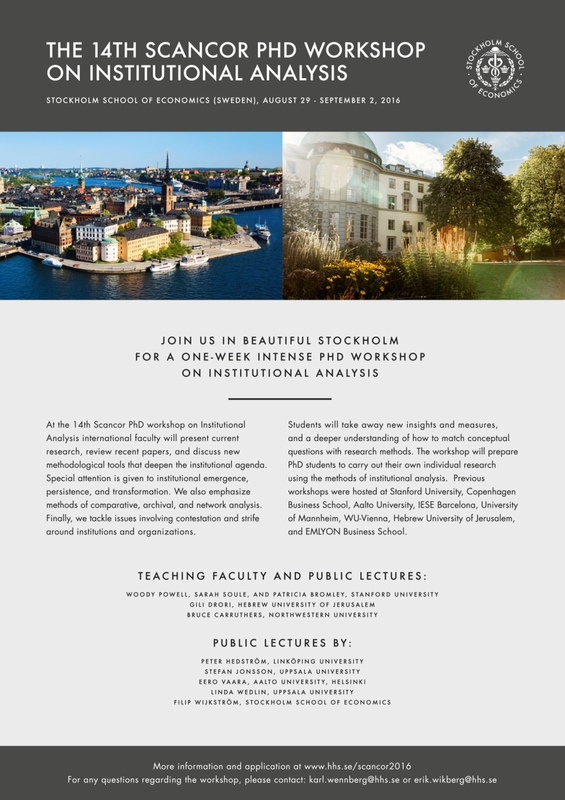 There will also be an open lecture series on topics such as “The Institutions of the Civil Society”, “Rankings and Competition in Higher Education”, “Social Movements and Institutional Change”, and “Historical Perspectives of Scandinavian and American Institutions”. Successful course attendants will receive a 7,5 ECTS course diploma from Stockholm School of Economics. The fee is €300, including lunches, study material, a welcome reception, and a graduation dinner. The course fee will be paid through PayPal before May 30th for all accepted applicants after acceptance letters have gone out, and the application process is handled online (see form below). Your registration is binding and there are no refunds on course fees. your research ideas and how they relate to institutional theory. Also upload a resume of your academic achievements including academic degrees, relevant work experience, publications (including working papers), as well as the name of your main supervisor. Please note that the maximum file size is 5 mb and that you should one upload one paper (written in English) that is representative of your work. Please note: In addition to the uploads below, please also send a letter of recommendation from your main supervisor to erik.wikberg@hhs.se before March 31. A decision on who will be admitted to the course will be announced in Late April. The course will take place in Stockholm August 29 to September 2, 2016. Woody Powell, Sarah Soule, and Patricia Bromley, Stanford University. Gili Drori, Hebrew University of Jerusalem. Eero Vaara, Hanken School of Economics, Helsinki. Filip Wijkström, Stockholm School of Economics. If you have any additional questions, please contact Karl Wennberg or Erik Wikberg (erik.wikberg@hhs.se). If you have any additional questions, please contact Karl Wennberg or Erik Wikberg.